The finest PCGS-certified 1838 Gobrecht Dollar pattern (J-85), graded PCGS PR65, is among the Simpson Collection coins on display at the PCGS booth (#807). The all-time finest 1836-1839 Gobrecht Dollar patterns set is on display for the first time on the West Coast here at the January 2015 Long Beach Coin, Currency, Stamp & Sports Collectible Expo. The display can be seen at the Professional Coin Grading Service (www.PCGS.com) booth, number 807, and is courtesy of the set’s owner, collector Bob R. Simpson of Texas, and Legend Numismatics of New Jersey. "This impressive ten-coin set has a weighted grade point average of 55.683, and is ranked as the number one finest all-time set in the PCGS Set Registry®" said PCGS President Don Willis. 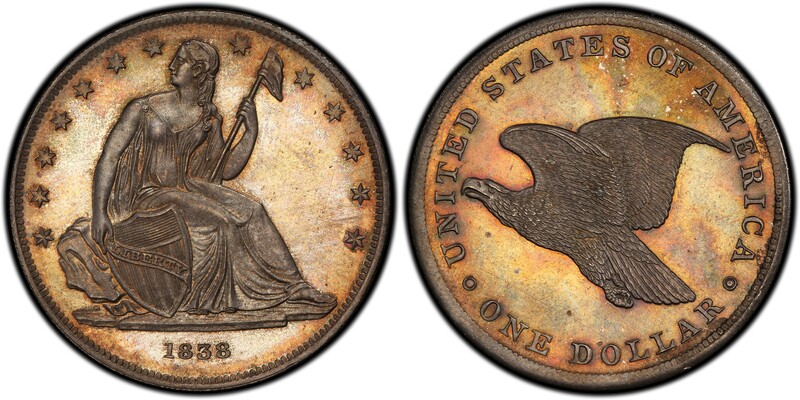 "The beautiful 1838 Gobrecht Dollar pattern (Judd-85) in this set is graded PCGS PR65, and is listed in the PCGS Population Report as Population 1 with none higher." "A dozen other high-grade Gobrecht Dollars from Simpson's unprecedented collection are also being exhibited at the PCGS booth," said PCGS Set Registry and Special Projects Director BJ Searls. "Visitors to the booth can get a free, four-color illustrated souvenir brochure about the Simpson Gobrecht Dollars, while supplies last." These are the coins in Simpson's PCGS Set Registry category "U.S. Patterns Gobrecht Dollar Patters - Silver (1836-1839)" with their Judd reference number, grade and ranking in the PCGS Population Report. 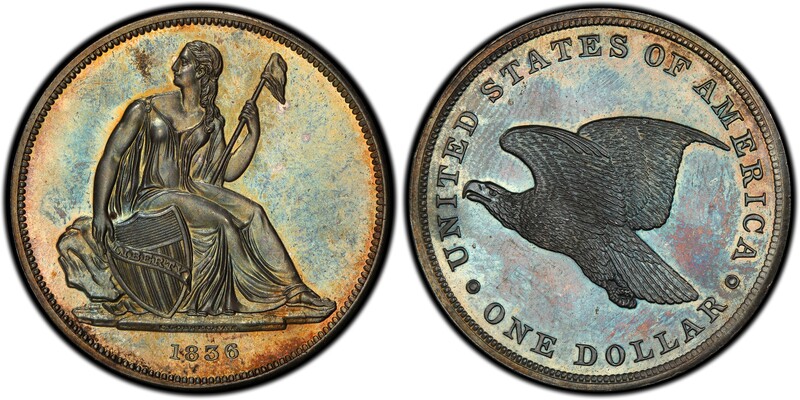 Tied for finest known, this 1836 Gobrecht Dollar pattern (J-65), PCGS PR65, is one of the highlights of the Simpson Collection you can see at the PCGS booth (#807) during the January 2015 Long Beach Expo. "The Gobrecht Dollar is the coin that started it all for Liberty Seated coinage. Their historical significance could not be any more important to U.S. Coinage in the 1800s. When I saw my first Gobrecht I was mesmerized. The sheer beauty, color, and size were astounding to me. The design is so intricate. Of all the coins I collect, I rank the Gobrechts as my second favorite behind $10 Indians," Simpson explained. "I thank David Hall and PCGS for allowing these coins to be displayed at Long Beach. I really hope people enjoy viewing these rarities. I can't imagine many people have ever seen more than one at a time. It’s been quite a challenge to build this set. With the help of Laura Sperber and George Huang of Legend Numismatics I have obtained many R-8s and a few unique pieces. It is my dream to one day have a complete set of Gobrechts," added Simpson. The PCGS Set Registry was established in 2001 and now hosts nearly 72,000 sets. For additional information about PCGS and its services, visit www.PCGS.com or call PCGS Customer Service at (800) 447-8848.